Welcome to the resource center for the Orbit BoosterPack! 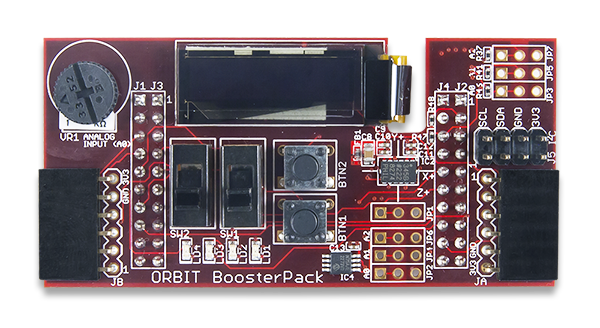 The Digilent Orbit BoosterPack™ is an add-on board for the Texas Instruments Tiva™ C Series LaunchPad microcontroller evaluation kit. The Orbit greatly expands the input/output capabilities of the LaunchPad, as well as introducing Digilent Pmod™ expansion connectors. Note: The Orbit Booster also works with the previous Stellaris® LaunchPad. Technical description of the Orbit BoosterPack and all of its features. The Wiki may contain more up-to-date information than the PDF. Download Orbit Booster basic demo for the Stellaris LaunchPad: A simple program that shows the functionality of some features on the board. Download Orbit Booster full demo for the Stellaris LaunchPad: Demonstrates use of the buttons, LED's, potentiometer and OLED display. Download Orbit Booster full demo for the Stellaris LaunchPad: Demonstrates use of the buttons, LED's, potentiometer, OLED display, accelerometer, and temperature sensors. Download Orbit Booster OLED library for the Stellaris LaunchPad: An API for use with the onboard OLED display. Download Orbit Booster basic demo for the Tiva C Series LaunchPad: Demonstrates the use of buttons, LED's, potentiometer and OLED display. Download Orbit Booster full demo for the Tiva C Series LaunchPad: Demonstrates the use of buttons, LED's, potentiometer, OLED display, accelerometer and temperature sensor. Download Orbit Booster OLED library for the Tiva C Series LaunchPad: An API for use with the onboaard OLED display.